The early years are a period of incredible growth in children. This assorted three-pack of workbooks helps early childhood professionals understand the developmental stages of young children. 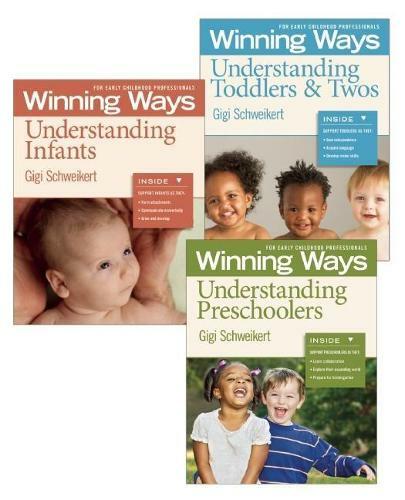 This set includes one copy each of Understanding Infants, Understanding Toddlers and Twos, and Understanding Preschoolers. These workbooks are perfect for in-house trainings, new staff orientation, and staff development. Age focus 0-5. Set of three workbooks, softbound, 72 pgs. each. "Gigi Schweikert understands what a gift and a responsibility being an infant teacher is. Her no-nonsense insights offer hands-on strategies for you to excel at your invaluable work." "Everyone working with young children should read this Winning Ways series. Gigi clearly knows and respects babies, toddlers and twos, preschoolers, and the adults who care for them. With her down-to-earth, practical and personal approach, she offers information, insights, and things to think about that will enrich your practice and help you make a positive difference in the lives of the children you care for each day."